Counterpoint, the interweaving of single individual voices was a prominant feature of music during the renaissance period. As the new century approached a new technique began to surface, harmony. The guitar was well placed to execute this new approach and strummed chords made a enriching addition to the precisely plucked techniques of before. 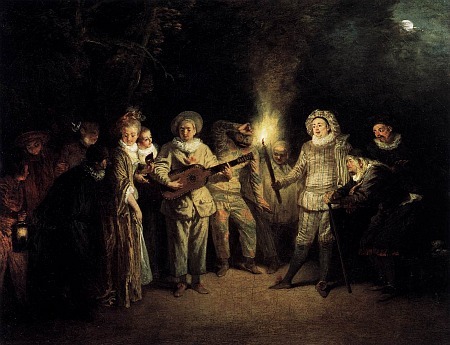 Where before it had been regarded as inferior to the lute and vihuela, and had been confined to barber shops and gypsy-campfires, the instrument now attracted the attention of the operatic stage and the courts of royalty. The good and expert painter has ready at his disposal all of the colors that are necessary for painting; they are available at his whim and fancy if he wants to paint a man, or a lion, or an ox. In the same way, we have equipped ourselves with all of the chord fingerings, that are like raw material and like the painter's colors, from which one can form every kind , of tonality and key by leaping from one [chord] to the next. 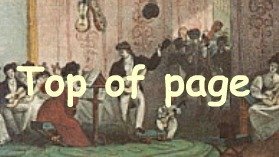 With these fingerings one can play the vacas, gallardas, villanos, italianas, pavanas - and other similar ones - in all twelve keys. And that which makes one marvel (and to many will seem impossible! ), is that with these chord fingerings, anybody at all can play along with any musical instrument on whatever piece one might play or might be able to play. Alfabeto is usually regarded as an Italian invention, but it is as likely to be Spanish or at least Neapolitan (from the province Naples) in origin. This because the Kingdoms of Naples and Sicily were under Spanish rule throughout the sixteenth and seventeenth centuries. Also two of the earliest sources to contain what later became known as alfabeto (both from 1599) : Cancionero de Bezon and Libro de cartas y romances espanoles del Illustrissima Senora Duchessa di Traetta are collections of Spanish lyrics with added alfabeto. 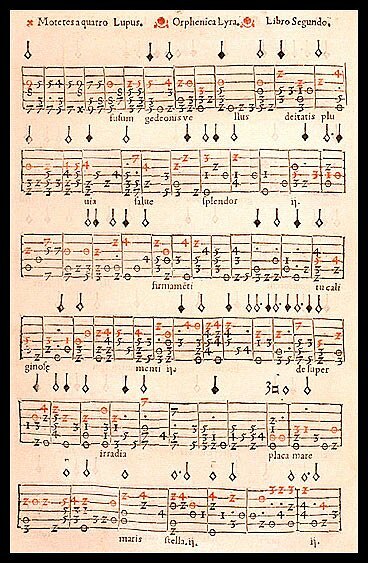 The first published use of the term alfabeto was in 1606 by Girolamo Montesardo in his Nuova inventione d'intavolatura per sonare li balletti sopra la chittara spagniuola senza numeri e note (New method of learning to play dances on the Spanish guitar without numbers and notes). 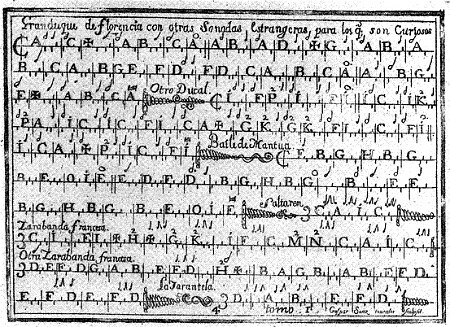 Alfabeto differs from Amat's earier system in that it uses alphabetic letters rather than numerals to indicate chords : Although alfabeto fingerings are handy shortcuts that tell the guitarist particular chord shapes, unfortunately these alphabet letters do not correspond to the names of the chords in a traditional music theory sense. That is, the alfabeto chord shape designated as "A" does not produce an A major harmony but instead results in a G chord. The ensuing match-ups are equally confusing and counterintuitive. 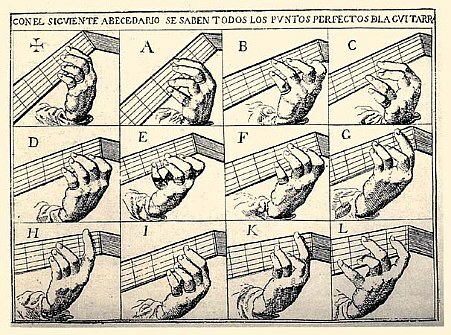 The alfabeto shape designated as "B" produces a C major harmony, the letter "C" results in a D major, the letter "D" produces an A minor... and the system winds its way forward in a semi-arbitrary fashion (1) 17th century sources emphasized that alfabeto was easily understood by players who could not read tablature or mensural notation. Though the practicalities of producing the manuscripts was more simple in that it was easy to copy by hand and could be printed from ordinary letterpress.